The steady warming trend of recent decades has been temporarily interrupted three times by large volcanic eruptions. 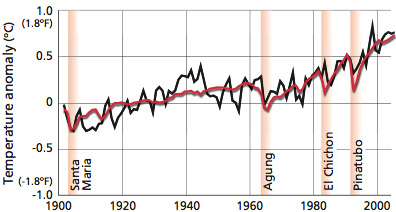 The red line is an average of climate model simulations for the 1900’s and demonstrates the models’ ability to replicate the temperature impact of large volcanic eruptions. Over the past three decades, human influences on climate have become increasingly apparent, and global temperatures have risen sharply. Although natural factors also influence climate, they cannot explain the recent warming. For example, since 1979, the Sun’s output, as measured by satellites, has followed its normal 11-year cycle of small ups and downs, but with no net increase. The two major volcanic eruptions of the past 30 years had short-term cooling effects, lasting two to three years. Tiny changes in Earth’s orbit and the angle of its tilt towards the Sun also influence climate, but only on very long timescales of 10,000 to 100,000 years. In addition, some periodic variations can have short-term effects on climate. 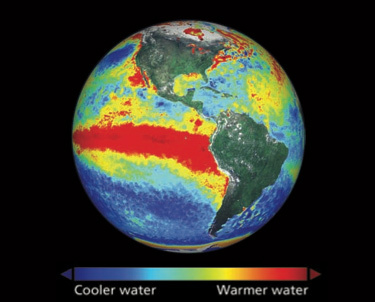 For example, changes in Pacific Ocean temperatures known as El Niño and La Niña events can temporarily alter temperature and rainfall patterns across North America, Europe, and Africa. A strong El Niño, in combination with ongoing human-induced warming, caused 1998 to be especially warm globally.